I read about bonsai to learn about bonsai. What does that teach me? nothing. So about a year ago I decided to do something crazy. I had recently bought a white pine, which is my favorite variety of pine, and was scared to death of killing it. I’m an over waterer, live in a humid climate, and can’t always depend on the quality of nursery soil. So I decided to give books another try. 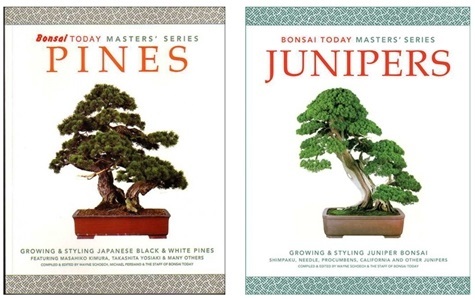 My affinity for Stone Lantern led me to their pine and juniper book set. I will tell you now, without a doubt, these are two books that you MUST have, regardless of your skill level. I’m not trying to provide a product plug here, but seriously go buy them… they are on sale… I promise you will learn at least one thing that you won’t find on the internet or in any other books. I have them too. Great books to get a good base of knowledge on growing evergreens. And good luck with the white pine!